Our Interpretation of Teleflora Country Basket. 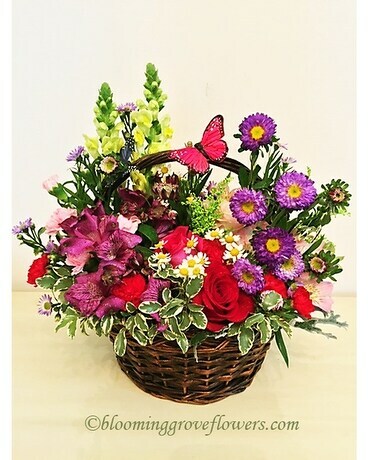 Featured flowers: roses, asters, snapdragon, peruvian lily, astrantia, fewerfew, fillers and greenery in a basket, decorated with butterflies. *Note: Exact plants and presentation may vary with seasonal and local availability to assure the best quality and selection for your special gift. Please call if you have any questions.